Plans are far advanced to merge and upgrade all lower courts in the country to Circuit Court status to help boost justice delivery. The Chief Justice, Sophia A.B. 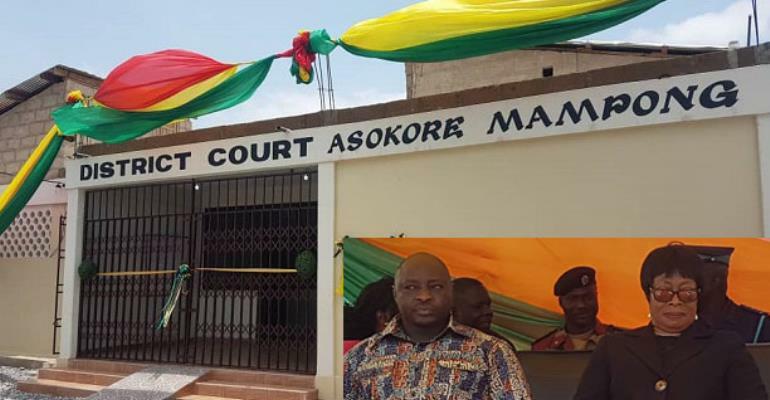 Akuffo, made the announcement at the official opening of the Asokore Mampong District Court yesterday. According to her, the lower courts are not in the position to adjudicate certain cases and that tends to create problems for justice delivery. She also said there are plans to create High Courts in all the municipalities across the country in order to improve accessibility to justice by the people. She commended the MCE for Asokore Mampong, Alhaji Alidu Seidu, for spearheading for the construction of the Asokore Mampong District Court. Alhaji Alidu Seidu, in his remarks, stated that the construction of the court would go a long way to influence the people in the area to be law-abiding. Nana Boakye Ansah Debrah, the Asoakore Mampong Chief, also stated that the court project would help to reduce crime and promote law and order.